I finished weaving the tris for the sleeve yesterday and as I had the sewing machine set up for something else, I decided to take advantage of this cool morning to put it to use again. 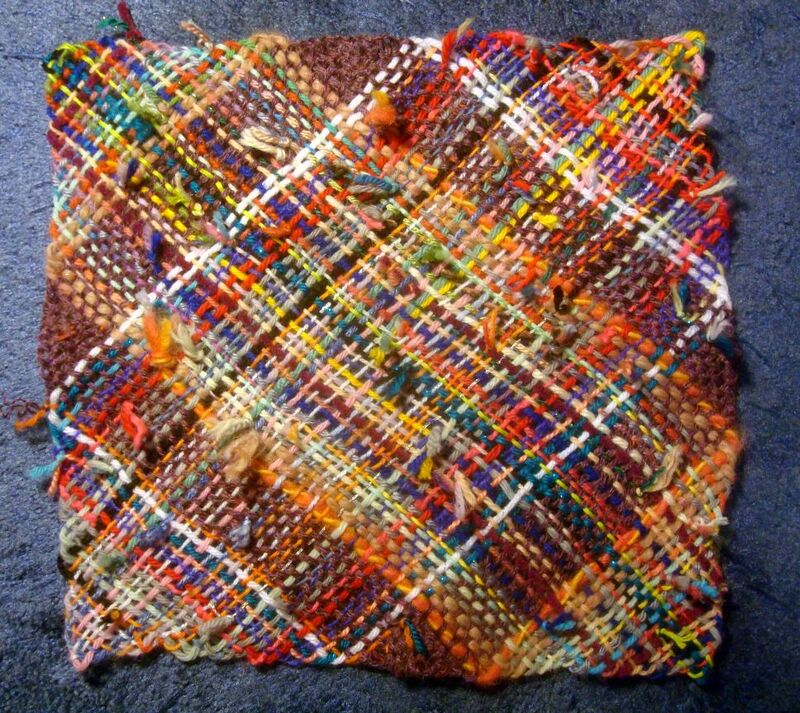 The woven blocks for the sweater, pin the pattern carefully over. I guess I didn’t get the photo, but next sew at the edges. 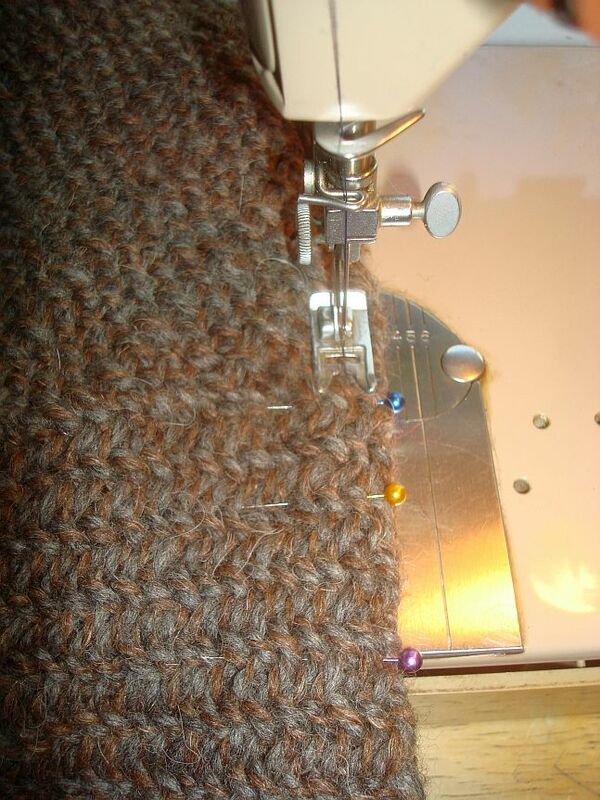 Use lots of pins and give you fabric support. You want it to lay flat so it doesn’t distort. Remember this one is bias woven. 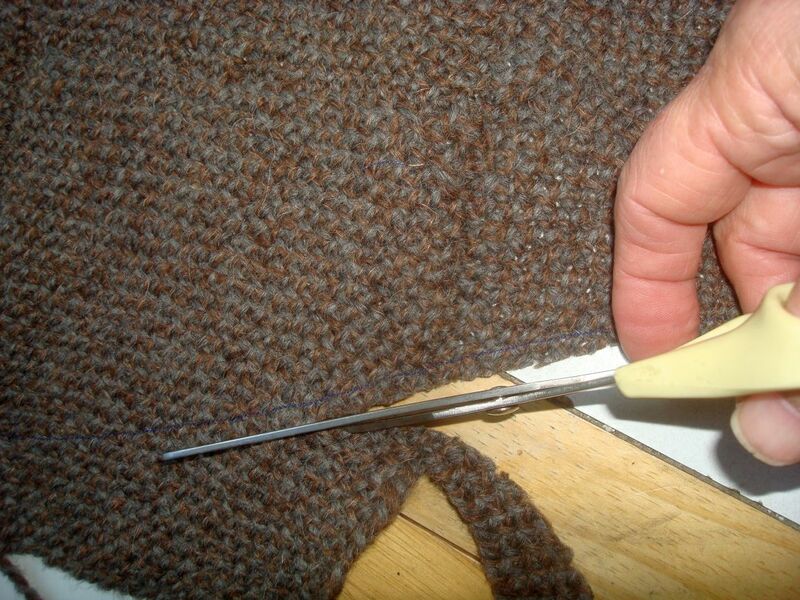 Once you have sewn all around in a contrasting color (it’s not going to show) carefully cut just outside the stitching. Pin closely! 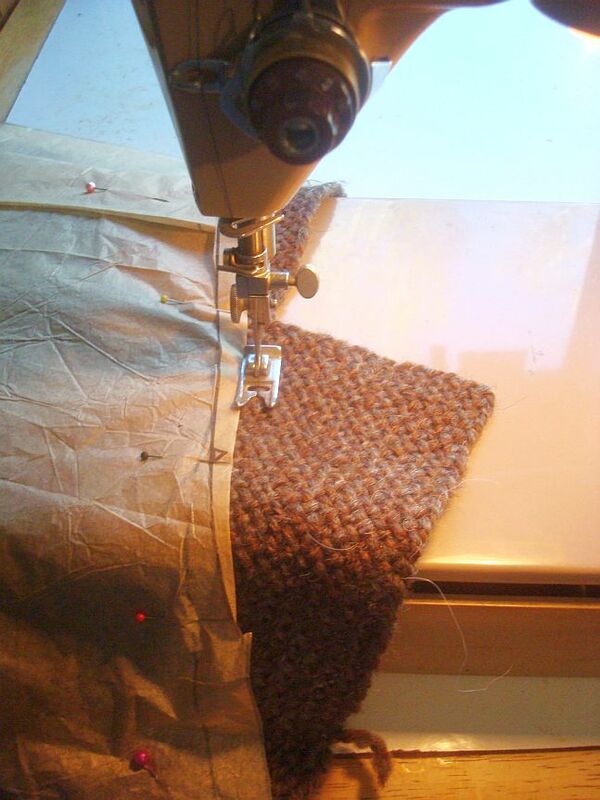 The more the better, especially on any bias squares that have not been stay stitched. The sleeve did okay, but sewing up the sides needed lots of pins. Again, support your fabric so it does not stretch or distort. 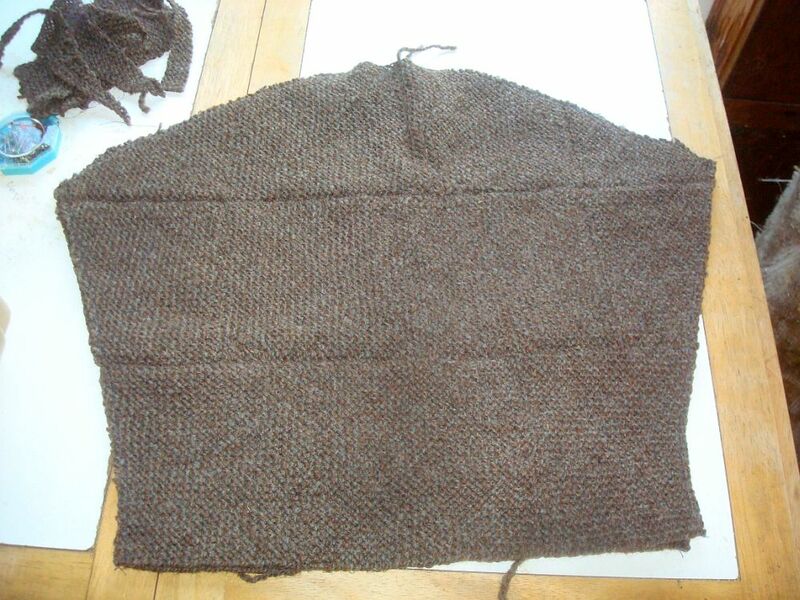 In fact, if this is your first project of this type, it may be a good idea to baste all of these seams and try the garment on, to be sure things are as they should be before committing it to the machine which is Much harder to undo. 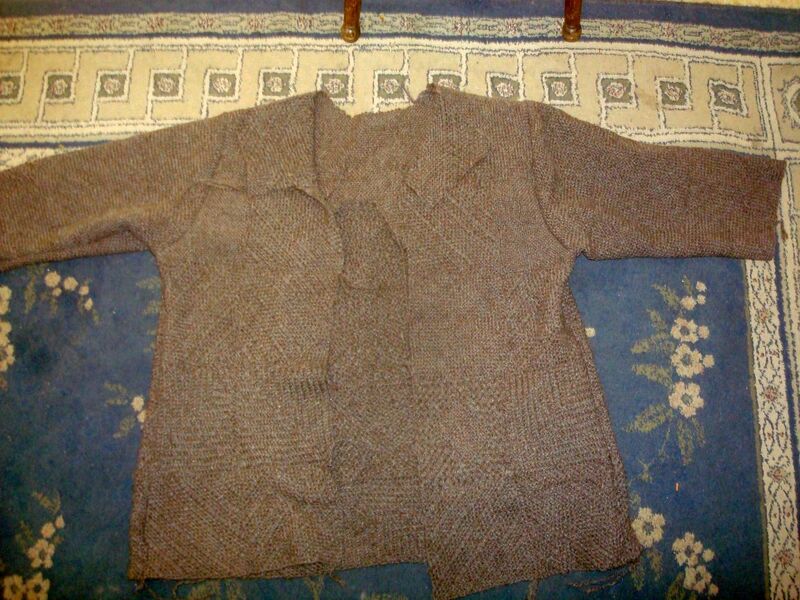 And here it is with the sleeves in. What’s left is the front button bands and the cuffs. However… Being the mature figger that I am, it is a little snug around the… er… hem. So I think I may have to add a bit in a A-line sort of way, to the front placket first. Have not quite thought that out yet, so still more waiting before I have a finished item. Still, making progress by leaps and bounds! Do any of you have projects to show me? I’d love to feel I’m not all alone here! Meantime, a little fun project! 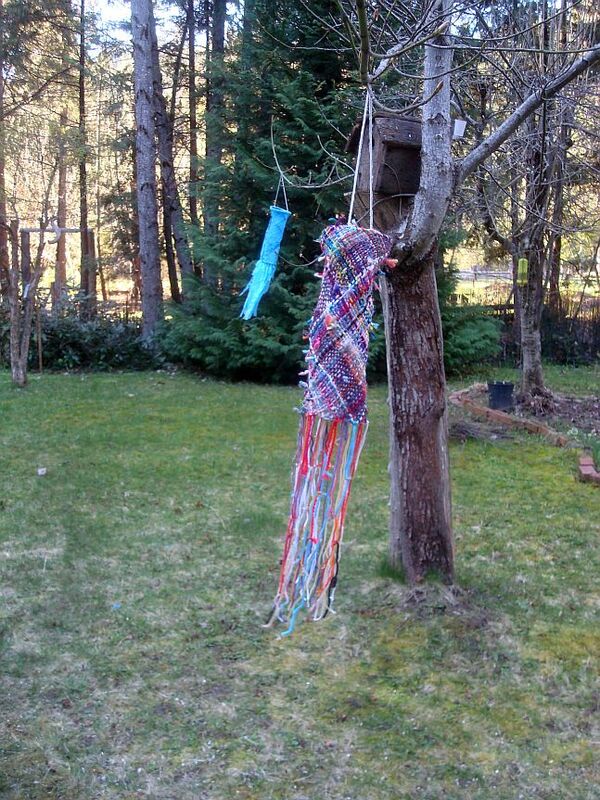 The windsock I made in April of 2008 has finally did what the plastic bag makers told us they would. It’s on it’s way back to it’s component parts. I tried to save it, but it was falling to bits as I worked . Then my eye fell on the basket of yarn snippets and scraps. The birds have never shown any interest is using this lovely nesting material so…. 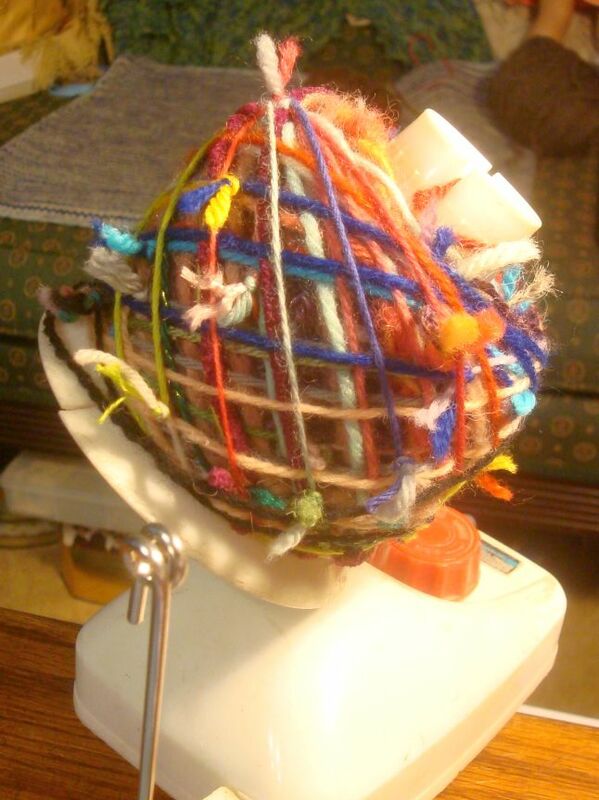 You can see that there were all sorts of bits in the basket, lace to bulky, wool, acrylic, mohair, cotton… I picked randomly and decided on the spot if it was long enough. It’s mostly pieces from about 4″ to several yards in one case. And I decided that the knots were a design element so pulled them all to the right side. But the knot-less side looks good, too. 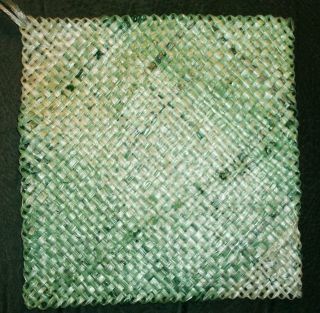 The green is a square I wove for the one that just ‘died’. If you have a stash of fairly young bags they do make light and fluttery wind socks. Mine lasted 7 years. I have no idea how long the yarn one is going to last. They all get exposed to all sorts of weather. And here it is out on the maple with the remaining plastic bag one. 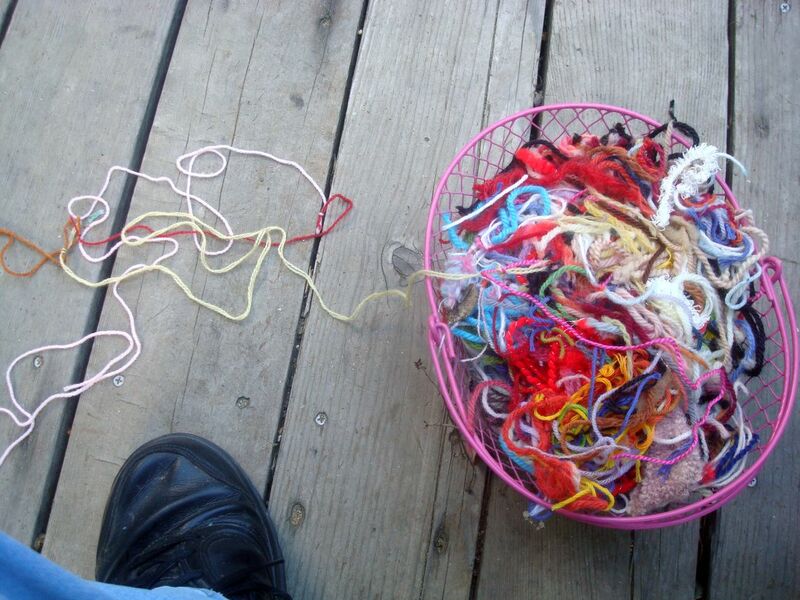 I still have a small ball of this knotted yarn so there might be more coming. After the cardigan is finished, of course! Nothing to report on the sweater. I think I needed a break from brown yarn. Too much brown in the world this time of the year, anyway. Things are starting to green up and I’m sure I can see a faint bit of pink in the buds on the peach tree. The flowering quince is definitely blooming now & there are even two tiny daffodils blooming out there in the brown. 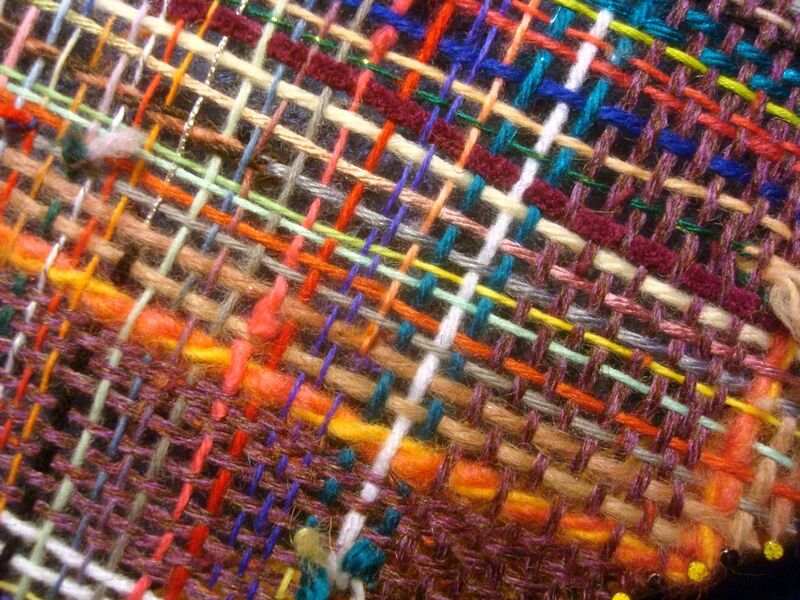 I have done some weaving but for the dolls. Little things. A KAL for Your Favorite Season. What would it be this time of year but Summer! Lexi is wearing Summer Nights and little Felicity is in the Sunshine. 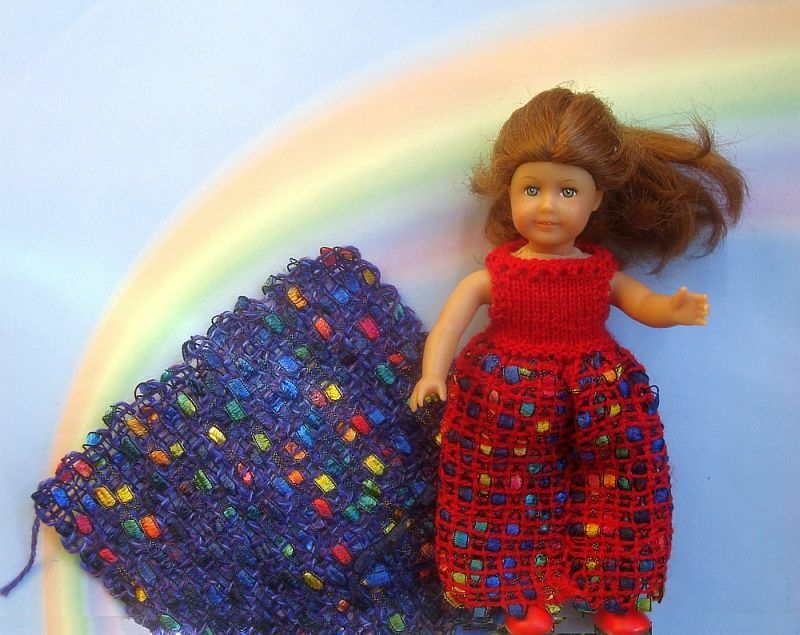 The skirts are the woven bits. Some Wildfoote sock yarn for Lexi’s and lace weight for Felicity’s to warp the first three layers and then woven with Lion Brand Trellis. 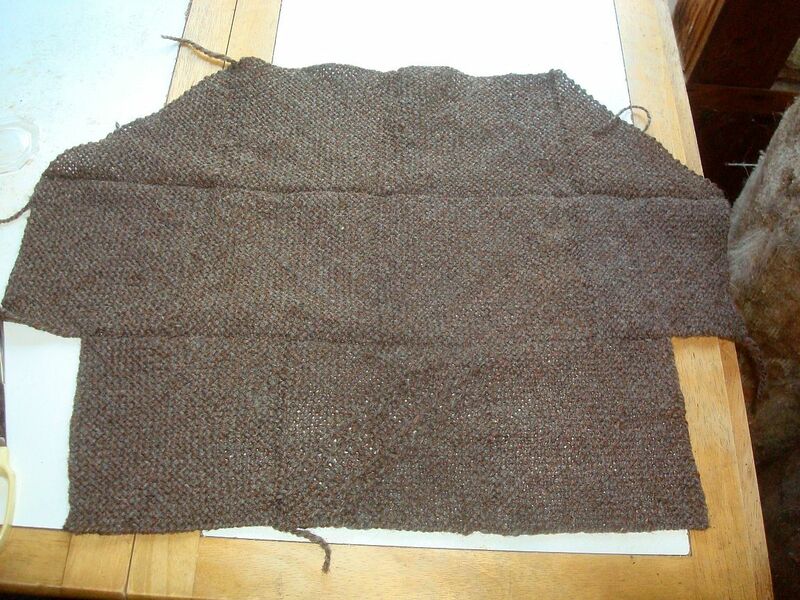 I used the 4″ and did o1, u1 for Felicity’s skirt, which is two squares and a knitted bodice. 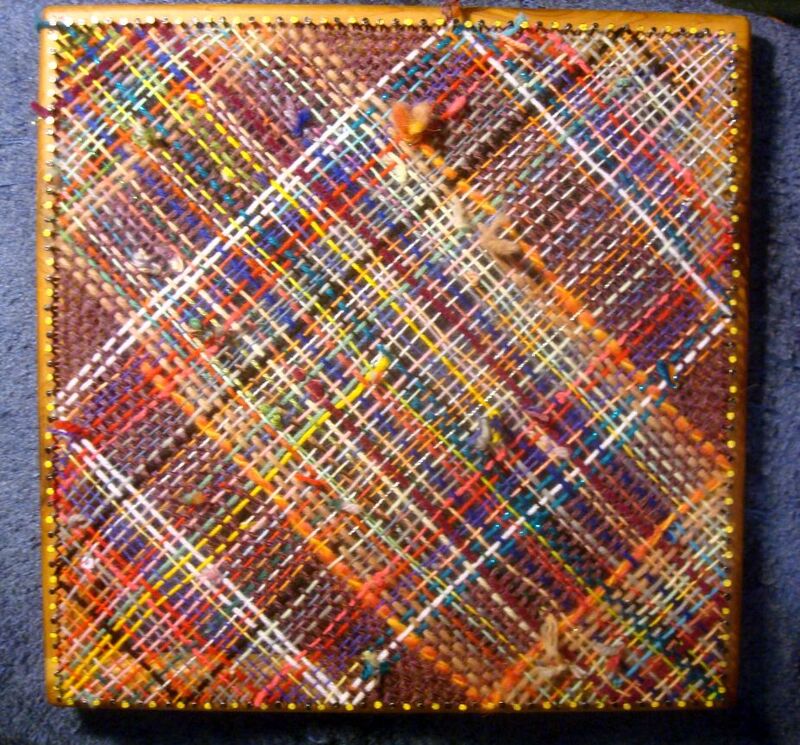 Lexi’s short skirt is three 6″ Multi Squares and I did hers in o3, u1 which gave it a really interesting texture and showed more of the colored squares, I think. I rather like the effect and since I have a couple more balls of this stuff (I think I bought 6 in a package at the dollar store a couple years ago) I may have to come up with another project for it. These are busy days, even if I have been ignoring brown. Randy is working long hours in the looms shop, (which means I am also) and we are trying to get the garden ready as it looks like spring is coming on early and dry here this year. We also signed up for 6 fiber fair shows this summer. The first one, a new venue for us, in Nampa, Idaho in May. then we’ll be in Hamilton, MT & Eugene, OR in June and Arcata, CA, Boonesville, CA and Canby, OR in September. I think I am going to sell my Baby Wolf Loom and it’s accessories. If anyone is interested we can bring it along to any of the shows. I don’t want to haul it around on speculation as even tho it is a small loom, it still takes up a lot of space in the 5th wheel. If you’re interested email for details. 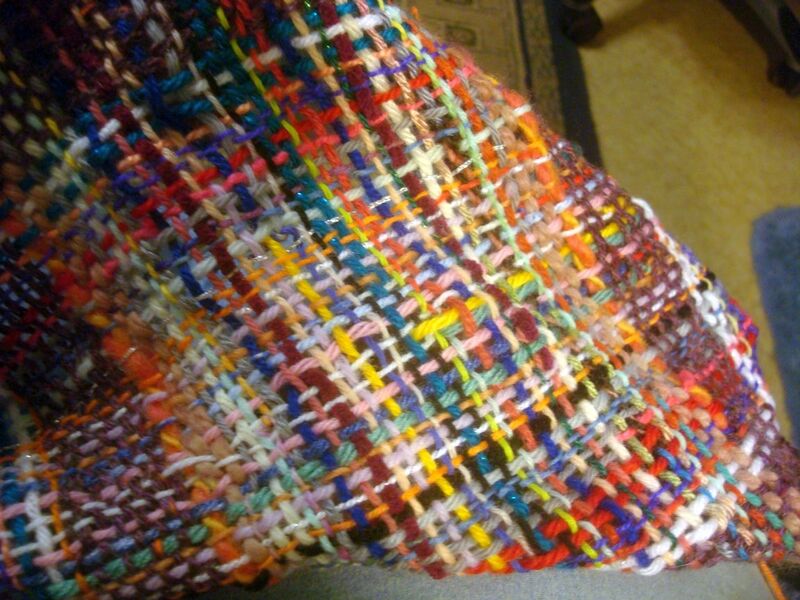 The loom works fine, I’ve woven a few times on it but I just don’t have the time or space for it. I still prefer my little looms. Hope you’re seeing a bright end of winter where you are.